Embroidery machines open up a new world of possibilities with your sewing projects. Using this one machine, you can personalize, embellish and decorate virtually any fabric. Some embroidery machines also offer regular sewing features, which allows you to enjoy the best of both worlds. Modern embroidery machines are typically computerized and use LCD displays for stitch and design selection. They also come with USB ports that allow you to import more designs that you purchase or create yourself. In this section, we’ve put together a simple comparison chart to help you see the key features of each machine. This should help you simplify your choice to find the best computerized embroidery machine for your specific needs. Below are our reviews of each embroidery machine. Listed are their key features, pros, cons and how they meet your needs. Brother’s SE600 sewing and embroidery machine is a step above the SE400. This computerized sewing and embroidery machine is loaded with features, offers a 4” x 4” embroidery area, and comes with 80 built-in designs and 103 built-in stitches. All of the embroidery designs can be previewed, too. You’ll know exactly what your design will look like without having to guess too much. Keep in mind that there are also easy settings to import custom embroidery designs. You’ll be able to import all of your “.pes” embroidery design files using a standard USB port. There are six embroidery lettering fonts to choose from. When it comes to sewing, the large screen and computerized settings will continue to help you advance your sewing projects. There’s an automatic needle threader that will help you save your sanity when trying to push the thread through the eye of the needle. In fact, all you have to do is touch a lever and the thread is neatly pushed through the needle. When working with embroidery design, where you’ll need to make several thread changes, the automatic needle threader is a great option. The work area is properly illuminated with a bright LED, making it perfect when dealing with darker fabrics that may be difficult to see. Sleeves and arms are easy to sew thanks to the free arm, and there’s also a jam-resistant quick-set drop-in bobbin. The drop-in bobbin allows you to drop the bobbin in the machine without having to “fish” the thread in the process. And the SE600 comes with a 25-year warranty. Technical support will be offered for free for the lifetime of the product’s ownership. While the SE600 offers impeccable features and a lot of embroidery-focused options, it doesn’t provide high-end monograms. The designs are beautiful, so it’s really dependent on what you hope to get out of the SE600. If you want to do embroidery on t-shirts, you’ll have your expectations for this sewing machine ruined. Otherwise, it’s the ideal option for anyone that wants a computerized sewing and embroidery machine that can do a little bit of everything. You’ll be able to sew t-shirts, jeans and even skinny jeans with ease. You’ll be able to choose from an array of different stitches, including decorative options for all of your home décor needs. And you’ll be able to import all of your embroidery designs with ease. The Brother SE600 does a little bit of everything, and offers a high-end experience at an affordable price with one of the world’s best warranties – 25 years. This would be one of the best embroidery machines for use in a home business. Click here to learn more about the Brother SE600 Sewing and Embroidery Machine. 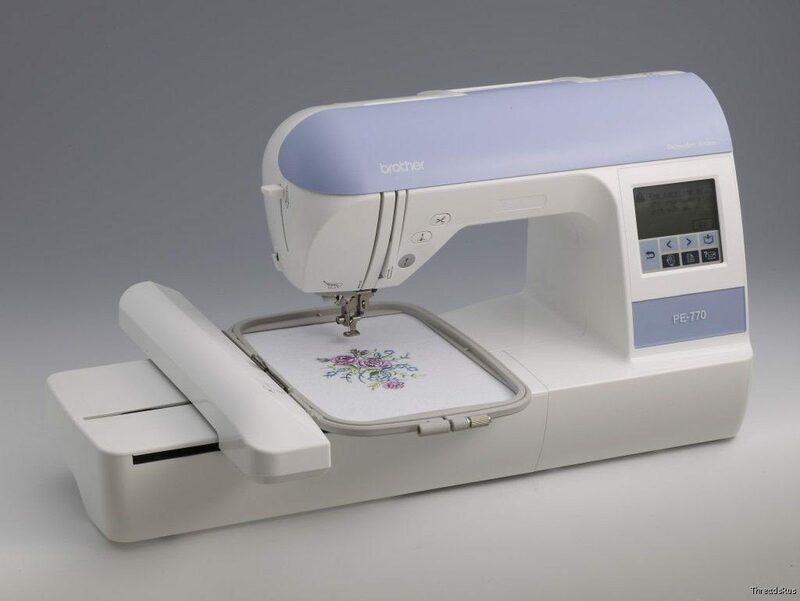 If you’re looking for an entry-level, cheaper embroidery machine for your home, the Brother SE400 may be a great option for you. This model is both a sewing machine and an embroidery machine, which gives you the best of both worlds. You can even quilt with the SE400. The machine offers 4”x 4” embroidery capabilities, 70 built-in embroidery designs, 67 sewing stitches and 5 lettering fonts. All of these functions are easily accessible through the touchscreen LCD display. You can also edit designs by rotating, mirroring or adjusting the size of images. Here’s the thing I really like about the SE400: I can import embroidery designs. This model can be plugged into my computer, so I can import designs I purchase from iBroidery.com and other sites. This function also makes it easy to update the machine in the future. Automatic needle threading, bright LED lights and a quick-set drop-in bobbin make this machine so easy to use. And the large embroidery area gives you plenty of space to bring your designs to life. There’s a lot to love about this machine, and it’s easily one of my favorite embroidery machines – especially for beginners. The SE400 comes with a 4” x 4” embroidery hoop, but this may not be large enough for some designs. If you plan to do some monogramming with this machine, you may need a 9” hoop to accommodate for longer names. 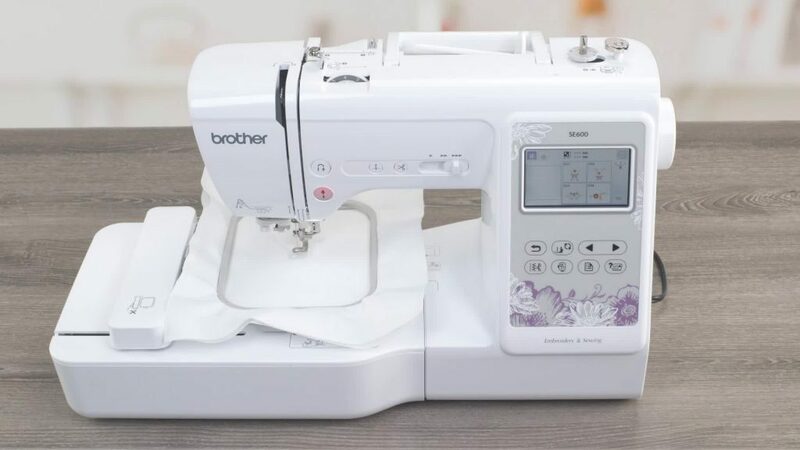 But all in all, the Brother SE400 is an excellent machine that’s easy to use and gives you the option to use it for either sewing or embroidery. If you don’t already have a sewing machine, this model may be a good fit for you. You can read our full review of this machine here. The Brother PE770 is a more advanced, dedicated embroidery machine. This model has a larger built-in hoop – 5” x 7” – which provides more space for large designs and lettering projects. In total, there are 136 embroidery designs included with this machine, which includes 12 border styles and 10 frame shapes. It has built-in memory, 6 letter fonts, a USB port and design editing functionality. The USB port allows you import designs from a thumb drive, which gives you virtually unlimited design options. Like the SE400, the PE770 allows you to edit embroidery designs with features like: mirror-image, rotate and size editing. The editing features – and the majority of the machine’s other features – can be accessed through the touchscreen LCD display. An automatic needle threader and quick-set bobbin allow you to get started with your projects quickly and easily. There’s also an automatic thread trimmer built into the machine. Some users have complained about the bobbin winding feature being a little fickle. At times, the winder wants to wind onto the metal instead of the bobbin. While this doesn’t happen to everyone, it can be frustrating. Every machine has its quirks. Still, the Brother PE770 offers advanced features at an affordable price, and it gives you plenty of space for large designs. Click here to learn more about the Brother PE770 embroidery machine. 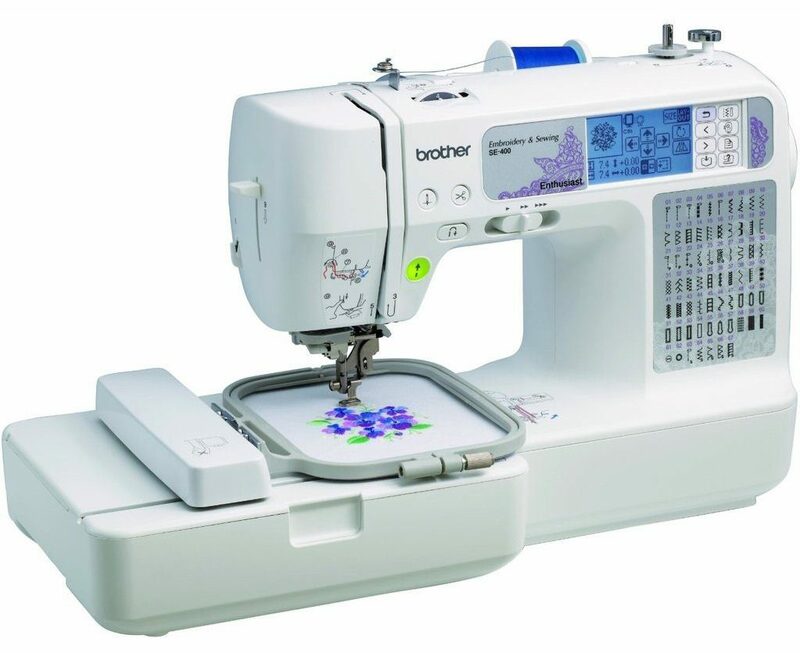 The Brother LB6800PRW is similar to the SE400 in that it offers both sewing and embroidery functions. One advantage it has over the SE400 is that it comes with a rolling carrying case, which makes it easy to take your machine to a class, meet or hotel if you’re traveling. With this model, you get a 4” x 4” embroidery hoop, and lots of built-in designs and stitches. In total, there are 67 sewing stitches, 70 built-in embroidery designs, 120 frame combinations and 5 lettering fonts. You can also connect this machine to your computer to import designs. Threading is easy, and a built-in automatic thread cutter trims your top and bobbin thread quickly and easily. There is also a 7-point feed dog system for smooth fabric feeding. All designs and features are accessible through the touchscreen LCD display. You can even edit your embroidery designs by changing the size, mirroring them or rotating them. This machine also has built-in tutorials that make it easy to learn how to use your new machine. Like with the SE400, the embroidery hoop may not be large enough for some monogramming projects. For longer names or larger lettering projects, you may need a bigger hoop. 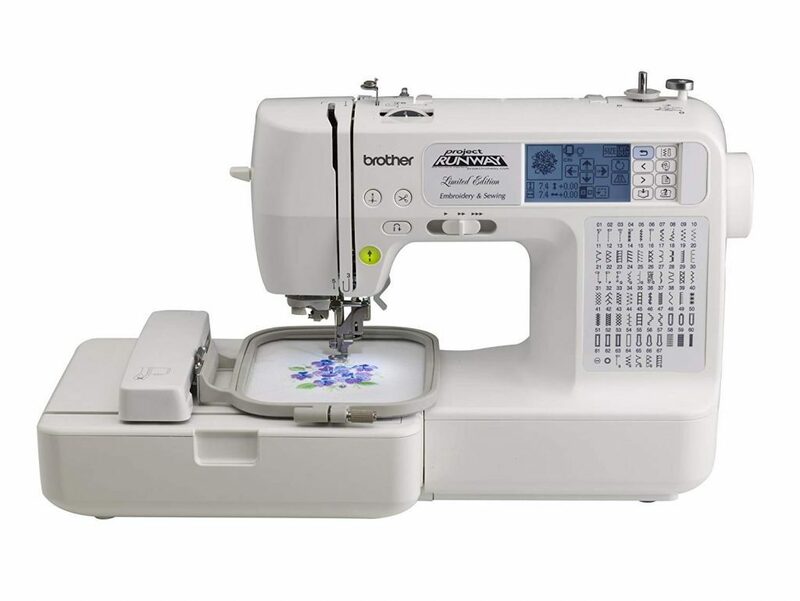 Overall, the Brother LB6800PRW is a great option for anyone who wants a sewing and embroidery machine in one. 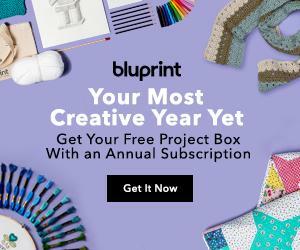 It offers advanced features and smooth sewing to tackle just about any project you can dream of. You can read our full review of this machine here. Click here to learn more about the Brother LB6800PRW. EverSewn’s Hero model is another sewing and embroidery machine combination, but this model offers more in the sewing department. This machine has more than 400 decorative, utility and lettering stitches – all of which are listed in the stitch library near the bobbin winder. Along with a vast array of stitches, the Hero offers 40 built-in embroidery designs and variable design sizes up to 110mm x 170mm. A 6.5” workspace gives you plenty of room, and EverSewn includes 8 different presser feet with this machine. The Hero can sew up to 850spm and has a detailed LCD screen. It also comes with a USB port that allows you to connect to your computer or thumb drive to import more designs. The only drawback with this machine is that the LCD doesn’t display the words or pictures that it’s embroidering. With that said, the Hero does a great job at embroidering and sewing. Many people prefer it for sewing over embroidery, but they admit that the embroidery function is excellent. I like the versatility this machine offers and the large working space for bigger projects. 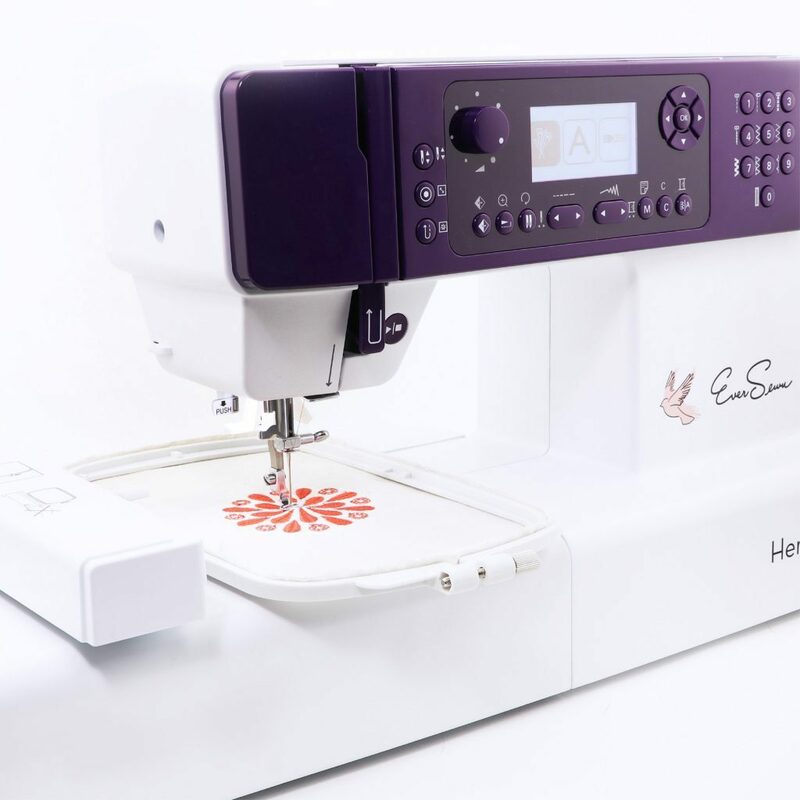 Click here to learn more about the EverSewn Hero embroidery machine. Sorry Vicki, but I have never used the Brother sb7900e so I can’t comment on it. Is it easy for a beginner to learn on this machine? If so, can they be self taught? Very interested but not a sewer and no nothing about this hobby. Thanks! Yes, this machine is very easy to use. You should be able to find quite a few videos on YouTube to help get you started. I usually recommend getting a book from the library to help you get a few basic skills down to get some confidence. Good luck! Can the PE770 accommodate a larger frame than the 5×7? How about service on this PE770? Local??? I am embroidering a binder cover, I want the letters to go under one another like on the side of a book. Can that be done on the PE 770?